The Rev. Robert Jules Raible preached his first sermon as Dallas minister in 1942. He had been born in Louisville, Kentucky, and had been brought up as a Unitarian. After graduation from Louisville Boys’ High School in 1917 and the University of Kentucky in 1921, he started to become a farmer; but, on suffering from an attack of poison ivy so severe that his mouth was swollen shut and he had to be fed through a tube, he gave up that plan. He worked for a Louisville bank for two years, then entered the Harvard Divinity School, from which he received his Bachelor of Divinity degree. In 1929 he received the degree of master of education from the Harvard Graduate School of Education. In June, 1924, Raible married Mildred Galt; and in 1925 he was ordained. For the next three years he was assistant minister at the First Parish in Cambridge, Massachusetts, serving under Dr. Samuel McCord Crothers and spending much of his time in work with Harvard and Radcliffe students. Then, for four years, 1928-32, he was minister of the First Parish at Peterborough, New Hampshire. In 1932 he accepted a call to become minister of All Soul’s Unitarian Church in Greenfield, Massachusetts. In Greenfield, where he served for a decade before leaving for Dallas, he engaged in many types of community work, including that of an air-raid warden. Mrs. Raible, born in Japan and reared in China, was the daughter of Congregational missionaries. Her father was a teacher at Yenchang University in Peking. In 1917 she was sent to the United States for her college education. She received a bachelor’s degree from Pomona College and later that of master of social science from Smith College. The Raible family included two sons: Peter, born in 1929, and Christopher, born in 1933. Mr. Raible immediately became popular as a minister, and the church began a new period of growth. He was also active as a community leader and was in demand as a speaker before many civic organizations. He was elected president of the Dallas Mental Health Association and the Dallas Council of Human Relations. In the fall of 1943 Mrs. Raible was named director of social services for the city-county hospital system. In 1944, the board of trustees voted to welcome two Negroes to church membership. Parents with sons, Christopher and Peter. In 1947, Mrs. Raible resigned as director of social service for the city-county hospital system to accept a position as supervisor of medical social workers at the Veterans Administration clinic at Love Field. In 1948 the church began a drive for funds for the $90,000 first unit of the new church. Soon after occupying its new home, the church began its period of most rapid growth, in one year adding as many as a hundred new members. The church then had 371 members. A new Great Books group held its first meeting at the church in 1951. In 1952 the church engaged an architect for an educational building. In 1953 the church expanded its library, and the Laymen’s League sponsored the formation of a Boy Scout troop. The World Federalists and the Americans for Democratic Action made use of the church buildings, as did the Society of Friends. 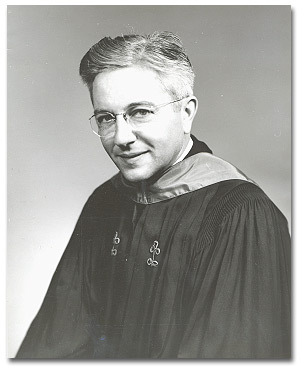 In 1953, Robert Raible, received the honorary degree of doctor of scientific theology from the Starr King School for the Ministry at Berkeley, California. With average attendance at the church school having risen from fifty to about two hundred in five years, efforts were speeded to finance and build the new two-story educational unit for the church on land recently acquired. Outside organizations using some of the church facilities included the National Association for the Advancement of Colored People, the Jewish Welfare Federation, and the Republican Women’s Club. In the spring of 1956 the church was flourishing more than ever, with two preaching services each Sunday and a nursery and a bookstall in operation. Both the Single Adults Group and the Married Adults were holding parties and picnics. The Liberal Religious Youth was comprised of students in senior high schools. The church in this period was permitting the use of its facilities by many outside organizations, including the Dallas School for Blind Children, Great Books, General Semantics, a Bahai group, a Brownie troop, Girl Scout leaders, the Junior League, the YMCA, the Cancer Society, a State Fair 4H group, Hadassah, B’nai B’rith, the League of Women Voters, and sponsors of various piano recitals. In 1961 a Unitarian-Universalist fellowship was formed in the Oak Cliff section of Dallas. Dr. Raible resigned as minister, effective on his sixty-fifth birthday three years later. 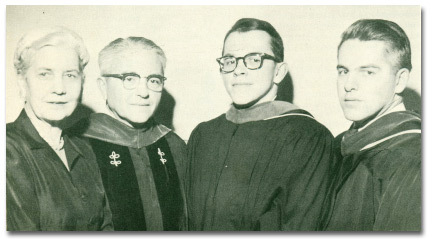 The first service in the new auditorium was held on April 5, 1964, with Dr. Raible presiding. General admiration was expressed for the new facilities, including comfortable pews, thick green carpeting, and ceiling skylights. On this first Sunday, recorded music was used, since the organ had not yet been moved. When the new auditorium was formally dedicated, the minister proudly was joined for this occasion by his two sons, the Rev. Peter S. Raible of Seattle, Washington, and the Rev. Christopher G. Raible of Milwaukee, Wisconsin. Dr. Dana M. Greeley, president of the Unitarian Universalist Association, spoke. At an evening meeting in the new auditorium, members bade farewell to Dr. Raible, who was retiring after twenty-two years as minister. Melissa Rice recalled the hobby of Dr. Raible in experimental tomato growing and told of his yearly disappointment when, on returning from summer vacation, he found that the tomato vines he had planted in the spring, watered carefully, and tied to stakes had wilted and died. In one August, she related, she and Fern Harper decided to play a trick on the minister, who was due home that evening after dark. The two women bought big, ripe tomatoes at a grocery store and tied them to the stakes and dry vines in the driveway strip of the Raible home. That night when the minister and his wife drove in and saw the red tomatoes, his eyes bugged out as if he were seeing a miracle. Dr. and Mrs. Raible left soon for the retirement home they had bought at Marlboro, Vermont. The governor of Kentucky, the native state of Dr. Raible, commissioned him as an honorary Kentucky colonel. — Abridged from Unitarianism in Dallas by Wayne Gard (Dallas: First Unitarian Church, 1973).